2008 Commanderie de Peyrassol Côtes de Provence Rosé, $14, Rosenthal Imports. Fragrant with ripe berries and a hint of orange zest. The palate is crisp and balanced, and there is a lovely mineral component, something like wet steel. Delicious food friendly wine, at a great price. If I had to pick only one rosé for the rest of the summer, so far this would be my pick. 2008 Domaine de la Sauveuse Cuvée Carolle Côtes de Provence Rosé, $14, Imported by Vintage Trading Inc. 40% Syrah, 30% each Grenache and Cinsault. Sauveuse is quietly making excellent and inexpensive wines in the Côtes de Provence, and farming organically too. They are intense wines, packed with fruit, and somewhat oxidative in character. This lovely rosé is the essence of fresh strawberries, and with a bit of air it has enough glycerin to feel a bit viscous in texture. There is a slightly peppery, salt pork nuance that I assume comes from the Syrah. There is good acidity and that metallic tang I mentioned above. 2008 Shinn Estate Vineyards Rosé, $13.50. My favorite North Fork of Long Island producer and this is my favorite Shinn wine. This compares very favorably to the above wines in both quality and price. Made mostly of Merlot, although I do not know the exact blend. This wine shows beautiful clean fruit, great acidity, and an energetic lean texture. David Page and Barbara Shinn practice organic and in some plots biodynamic farming, and treat their vineyards as the living ecosystems that they are. My notes from a few years ago say that this wine is fermented entirely using indigenous yeasts. Really a lovely wine. 2006 Château Font du Broc Côtes de Provence Rosé, about $23, Imported by Meilleurs Vins de Provence. Disclaimer - I received this wine as a sample from the importer. 60% Mourvèdre, 20% Carignan, 15% Syrah, and 5% Grenache. Lovely strawberry fruit and I love the hint of animale on the nose - the influence of the Mourvèdre, no doubt. This is delicious wine, but it doesn't feel as fresh as it should, and that's probably because the acidity is not all that strong. 2008 Domaine des Deux Anes Vin de Table Le Rosé, $14, Jenny & François Selections. Mostly Carignan, although I do not know the blend. This is a strange wine, and in the end, I liked it. But BrooklynLady did not, and I suppose that it might provoke that kind of reaction at many dinner tables. This is not a passive wine that will go unnoticed as people talk and eat. At first it seemed too earthy, a little dirty almost, but it just needed time to flesh out. This is serious rosé, with blood orange and grapefruit, nice acidity and good texture. But the palate is a bit unusual (perhaps explaining the VdT status), with something like a Chinato flavor profile. Not for sipping - have this with lamb kabobs or grilled fish with a mess of herbs. 2007 Domaine du Deffends Côteaux Varois Rosé d'une Nuit, $20, Robert Chadderdon Selections. A blend of Grenache and Cinsault, don't know the exact proportions. Ripe fruit with a definite herbal undertone, a lovely nose. Good fruit on the palate, but without any real definition or snap, and in the end, not all that satisfying. Which is too bad, because this is supposed to be a great wine. 2008 Macari Rosé, $15. Disclaimer - I received this wine as a sample from the producer. Another wine from the north Fork of Long Island, another Merlot blend, but this one is not in the same class as the Shinn wine. This one smells like a chemistry set - the fruit seems artificial, it made us think of pop rocks. Same on the palate - too sweet in an artificial way. 2006 Domaine Mugneret-Gibourg Bourgogne, $32, Michael Skurnik Imports. Every year I try to buy a couple of high end bottles to put away in the cellar, but also a few "lesser" wines by great producers, wines to enjoy when young. File this in the lesser wines from great producers department. Not to say that is a lesser wine - it is a fantastic Bourgogne. But within the Mugneret-Gibourg portfolio it is low end, and therefore accessibly priced. I think of Mugneret-Gibourg the way I think of Fourrier or Ghislaine Barthod - each well known among Burgundy lovers as rising stars, each making wines of stunning purity and grace that provide a clear window to terroir. In a region of expensive wine, Mugneret-Gibourg wines are not cheap - they command between $50-80 just for villages-level wines, 1er Crus now cost upwards of $85 per bottle. There are three Grand-Cru classified wines: Clos Vougeot, Échezeaux, and Ruchottes-Chambertin, and these wines cost what Grand Cru Burgundy costs, although some would argue that they offer great value even at the $165 plus per bottle, as they represent some of the finest examples of wine from those places. What about the humble Bourgogne? At $32, does it offer good value? I can emphatically say yes. First of all, it is delicious wine, offering everything one could want in a young Bourgogne. And relative to other regional wines, I think this this is among the better ones. It shows a lovely perfume of pure ripe dark fruit, and with a little air there are interesting spice, smoke and herbal notes. Even with a few hours of air, though, the nose is not entirely open. This wine, even though it is a humble Bourgogne, has the structure to improve in the cellar for a few more years. This wine comes from vines that were once classified as villages-level Vosne-Romanée, in a plot called Les Lutinières, just north of Nuits St Georges. The wine reflects some of the character of both of those places, with sweet spicy dark fruit and a gamy undertone on the palate. It is impeccably pure and fresh and just a pleasure to drink, and it is balanced and transparent as seems to be the character of the 2006 vintage, a vintage that I imagine will never be given the credit it should in the shadow of the massive 2005. Excellent from the moment I pulled the cork, what put this wine into "wow" territory for me was how incredibly detailed the palate became after about 90 minutes open. It was as if I could taste the jet-black skins, and their spicy juice, the seeds and stems, the soil, and the tiny bit of wood. Detail like that requires remarkably pure fruit and clean wine making. Maybe it was the beautiful sunlight seeping through the trees on our deck, my sleeping kids, and dinner with my lovely wife, but I think the wine was amazing too. I'm excited to re-visit this wine in about three years. And even more excited to one day open the fancier Mugneret-Gibourg wines that are just beginning their long sleep in my cellar. The other night my generous friend Adam came to dinner and brought with him a truly fantastic bottle of Champagne, Larmandier-Bernier's Brut Premier Cru Blanc de Blancs. Larmandier-Bernier is one of the best producers in the Côte des Blancs, making delicious wines of finesse and purity that can be thrilling in their clear expression of terroir. Any bottle by this producer is special, but some are more special than others. The thing that made this particular bottle so special is that it was disgorged in June of 2005. This is before team Dressner began to import the wines, back when Pierre and Sophie Larmandier-Bernier were working with Terry Theise and Michael Skurnik. We're talking about four years of bottle age here, more than most of us give our non-vintage bottles. More than I do, anyway. There is no code etched onto the bottle (recent bottles have an etched on the glass that reveals base year and disgorgement date) so I cannot be certain about the base year, but I'm guessing 2002 grapes primarily, and bottled in 2003. What happens to high quality non-vintage Champagne when you cellar it? There are some folks who will tell you that nothing happens, except that the wine loses freshness. Perhaps that is true regarding many generic Champagnes, but not with wines from producers like Larmandier-Bernier. This wine was just fantastic, with a captivating nose that showed a regal and mature character, but still with great vibrancy and freshness. And it got better over the hour it was open, its nose broadening and its mineral and nutty flavors really crystallizing. The mousse is really just a gentle buzz on the palate, with great depth of fruit and mineral, and a lovely savory note that Adam described as Hoisin. Absolutely finely integrated - a well oiled machine. Truly memorable and delicious wine, a wine that has me re-thinking what I want to do with Champagne in my own cellar. A New Method for Cooking Steak, and the Best Bottle of Red Wine I've had in Months. Bring the steaks up to room temperature - take them out of the fridge a solid two hours before cooking. Do not salt or season them in any way until right before cooking. Put the steaks in a 275 degree oven for 25 minutes (the steaks were about an inch and a half thick), and then sear them in a hot pan on the stove top for just moments per side, only for color. My friend was skeptical - he thought the steaks would be overcooked. But he followed this advice and said the results were great. So the other night when I had a hankering for a good steak, I decided to try this method of cooking. I went to the food coop and grabbed a pound of beautiful strip steak by Slope Farms, without question my favorite source for grass fed, no antibiotic, no hormone, free range, yoga practicing beef. I did this at about 4:30 and since BrooklynLady and I would eat at about 7:30 after our daughters were (hopefully) in a deep sleep and would not hear the clanging of cooking pans, I left the steak out on the counter to come to room temperature. I followed the instructions exactly - seasoned the meat just before putting it in the oven at 275 degrees for 25 minutes. Potatoes finished roasting, a simple green salad composed, and after 25 minutes I took the steak out of the oven. Nothing had happened - it looked as though it hadn't cooked at all. It was deep purple and still marbled with fat. Okay, to the pan and we'll eat in 10 minutes. But touching the steak, it was clear that it had, in fact, cooked a bit, and the side touching the rack was a bit gray. It felt essentially the way steak feels when it's cooked rare to medium-rare. Weird. So I continued with the plan and seared it for a moment or two on each side, and let it rest on a cutting board for a few minutes. Can I tell you that this steak was fantastic? The inside was perfectly rosy and meltingly tender, and the outside was seared for that caramelized complexity and great texture, but there was no gray layer of overcooked meat between the outer char and the rosy interior, as I usually get when I pan-fry a steak. This one was just perfect, and I'm totally sold on this method. What wine with this simple but still decadent feast? BrooklynLady requested a Rhône red, but the only bottle I had in the house turned out to be corked, an Ardeche Syrah by Joseph Gonon. We decided to open a special bottle, a 1999 Chateau Musar, $36, Imported by Broadbent Selections. I've had this famous wine from Lebanon on several occasions and enjoyed it each time, but this was far and away the finest bottle I'v e had. It was simply stunning wine, and we savored every drop. It was a perfect pairing with our meal, which may in turn have elevated the wine a bit, but it was perfect nonetheless. Can you imagine spending $450 for a top left bank Bordeaux when you can buy this wine for about $40? Okay, not exaclty the same thing, but similar style of wine that pairs with the same types of food. This iconic wine is primarily Cabernet Sauvignon blended with Cinsault and Carignan, all old vines, and all grown at high elevation where there are cool breezes and the grapes can retain lots of acid. Gaston Hochar, the proprietor of the estate, holds wine until he feels it is ready for release, and 2000 is the current vintage on retail shelves. NV Champagne Raymond Boulard Mailly Grand Cru Brut Nature, $42, Imported by Selected Estates of Europe. This wine is an outstanding example of a Brut Nature, a Champagne with no sugar or other sweetener added to the dosage. If you aren't familiar with this sort of thing, it is extremely fashionable among the wine hipsters of the world to drink Brut Nature or Extra Brut Champagne right now. Perhaps because some of these wine hipsters claim that the expression of terroir in Champagne is possible only in non-dosé wines. Perhaps because the people with the coolest haircuts and iPhone apps drink non-dosé Champagne, and others simply follow along. Whatever the reason, non-dosé Champagne is very popular now, and many producers now offer a non-dosé Champagne amidst their portfolio of wines. But it is not easy to make a good non-dosé Champagne. As Peter Liem of ChampagneGuide.net has said, "You cannot just take your regular Brut NV and decide that you will not add any sugar to it." Skilled and dedicated work in the vineyard is required in order to yield fruit that is ripe and flavorful enough to make good non-dosé wine. There are several in the group of young and hip Champagne vignerons who are making great non-dosé wines, and for more on that you should consult ChampagneGuide.net. I will say this - Francis Boulard's Mailly Grand Cru is a very fine non-dosé Champagne. And this bottling is particularly exceptional. It was disgorged in February of 2008, which leads me to assume that it is based on grapes from 2005, and bottled in 2006. '05 was warm in Champagne, as in most of France, and so Boulard had a cooperative climate to work with for this style of wine. I last drank this wine about a year ago, and I decanted it, to everyone's horror. That one was a great version of the wine, more soil and mineral driven. The new version is overtly fruity and joyous on the nose, with an intensely vinous character. It is, as it will always be, a wine that is defined by minerals. 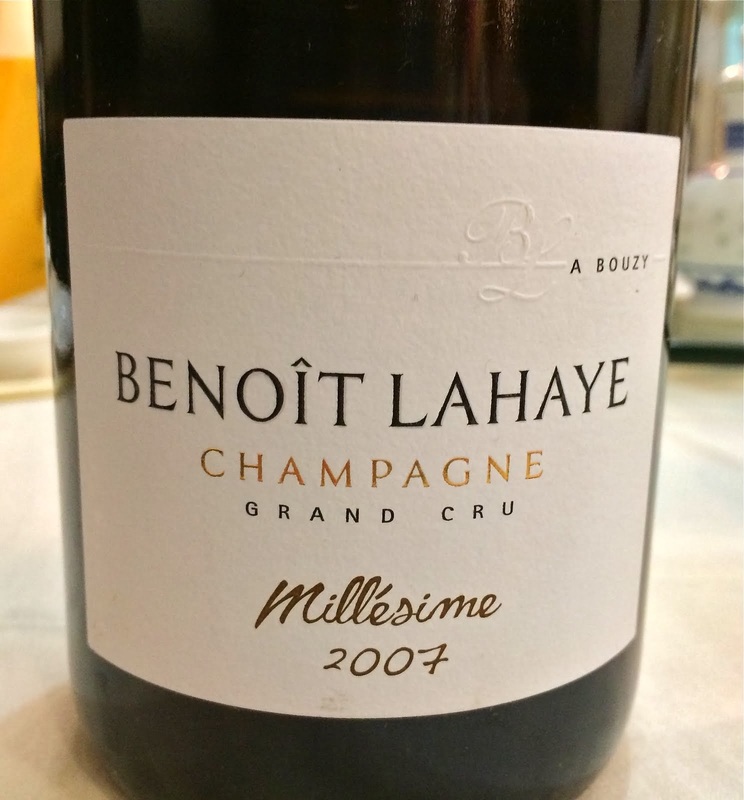 According to ChampagneGuide.net the grapes for this wine are grown on a plot that has "only about five to ten centimeters of topsoil, under which the roots descend immediately into the chalk and limestone bedrock." But in this iteration, the ripe and lovely fruit competes for your attention. It is vivid red fruit, and it is juicy, and it is relaxing in a warm bath of chalk. The wine is perfectly balanced with excellent acidity, and it has a beautiful fragrant length that lingers long after swallowing. Perhaps the most impressive thing to me, though, is that this wine, which is about 90% Pinot Noir, is wonderfully elegant. It really has grace and delicacy to compliment its vibrant fruit and minerality. It is just outstanding wine, and although the price has risen since I last drank it, it continues to be a great value in the world of Champagne. By the way, when I opened this bottle the other night, I again decanted it. But this time I decanted only half the bottle, so my friend and I could compare the decanted wine to the wine out of the bottle. My friend perfectly described the difference after about 15 minutes of air time: "The decanted wine is more powerful, and the wine from the bottle is more elegant." My oldest daughter is 2 years, 4 months old. She's a precocious little one with plenty of her own ideas. I never thought that I would ask this question, but is it possible that she's getting too much exposure to wine? Earlier this week I was holding a glass of sparkling wine and talking to my wife who had just gotten home from work. My daughter had been playing by herself in the living room, but then walked over to me and said "What are you doing Daddy?" "Drinking a glass of wine with Mommy," I replied. "No Daddy, that's Champagne," she said. Hah, that's cute, isn't it, that my 2 year old knows the difference between still and sparkling wine. We decided simply to laugh it off and enjoy her bright little mind. And then tonight, as I was snuggling her during her bedtime ritual, she was drinking from her water bottle. She looked at me and said "This is my wine Daddy." I just smiled at her and didn't pursue it, but wow - that's a lot of wine in the mind for a 2 year old, isn't it? Should I be worried about this? First of all, I think this whole asparagus are impossible to pair with wine thing is exaggerated. They require a bit more consideration than say, roast chicken, but they're just asparagus, and they're so delicious this time of year. But asparagus have developed this reputation as impossible to enjoy with wine, and I think it's not so. The biggest mistake is to pair asparagus with a fruit-driven wine, which means avoiding most American wine, and most new world wine in general. Asparagus are the anti-fruit, and they don't work well with fruity wine. Please, whatever you do, be very careful mixing asparagus with rosé wine. Honestly, you can hurt yourself and your guests with this pairing. It's not just that asparagus are not fruity - roast chicken is not fruity either, and yet a roast chicken pairs beautifully with Beaujolais and other fruit-driven wines. We're talking about the anti-fruit, here. When serving asparagus, I try to go with wines that somehow echo their chlorophyll, grassy, slightly cheesy essence. For me, the classic pairing is Sauvignon Blanc. I'm talking about wines from Sancerre or Touraine, for example. Not from Cheverny, though, as those wines, while tasty, can be more akin to the New Zealand pungent style of Sauvignon Blanc, which I think when combined with asparagus is simply too much cat pee and grass for any household to deal with in one evening. I'm thinking Clos Roche Blanche Touraine Sauvignon Blanc, or a good Sancerre. But this spring I've tried to branch out a bit, to varying degrees of success. I pictured a dry Alsace Gewurtztraminer and imagined it would be great, its pungency somehow working with asparagus. The jury is still out on that one. The Qupé Marsanne from the previous post was served with fish but also with asparagus, and it worked - the wine is mineral-driven and didn't conflict at all with asparagus. But tonight, my friends, I think I hit on something really good. First, I should tell you that although I used to do things like parboil or saute, season with sesame oil, bonito shavings, or parmesan cheese, or otherwise get fancy with asparagus, now it's all about simplicity. BrooklynLady turned me on to roasting asparagus, and I'm hooked. Just don't over cook them and they're great with only a pinch of salt, maybe a dab of butter. If they're in season and farmer's market fresh (the only time we eat them), roast them with nothing at all. Naked asparagus, if you will. 15-20 minutes at 400 degrees for asparagus of medium circumference, and they're slightly firm and totally toothsome. Last night for our pan-fried Porgy and roast asparagus I had already settled on Sauvignon Blanc, when it hit me. Sparkling wine. Not Pinot Noir based, but a Blanc de Blancs. But not Chenin Blanc either - too much fruit. I opened what is still my favorite under $20 sparkling wine, the NV Domaine de Montbourgeau Crémant du Jura, and it was delicious, a great pairing. Although I've heard talk about Savagnin in this wine, I think it is all Chardonnay. It is a soil-driven wine from a great producer in L'Étoile, one of the four Jura appellations. The nose is earthy but fresh and pure, and the palate is snappy with acidity and bright with chalk-infused citrus fruit. Nothing here to offend the anti-fruit. And there is something about the texture of the sparkle that just worked perfectly with roast asparagus. But maybe that's because sparkling wine works with anything. To be tried again, if there is still asparagus at the farmer's market next week, and there should be. 2007 Qupé Marsanne, $22 east coast price, out west it costs $18. I know, it's a California wine! You don't read about many of them on this site. This is a special wine, though, very much old-world in style. It is the antithesis of today's typical high alcohol, overripe, overblown California wine. I bought it on a hunch, knowing essentially nothing about the producer. I knew that Qupé wines are supposed to be good, but that's it. The blend caught my eye first - 88% Marsanne and 12% Roussanne, and I've lately been exploring white wines made with these and other traditional Rhône grapes. Then I saw "12.5% alcohol," and that sealed the deal for me. California, I think it's important to grow Marsanne in cool climate so it has better acidity and gets to physiological ripeness at lower sugars. And this sensibility really comes through in the 2007 Marsanne. The wine is perfectly balanced, with great acidity supporting the ripe fruit. It is completely dry, yet the alcohol is impossible to detect. The nose is very fresh with floral and tropical hints, bitter herbs, and a waxy mineral underbelly. There is good structure and length and the wine has great texture. It does not have the intensity of say, the 2007 Gonon St. Joseph Les Oliviers, but it's just delicious, really a pleasure to drink. And it's funny - I looked on CellarTracker and the comments are not particularly complimentary. People don't think the wine has any fruit. Those people must be used to jammy wines that are in the new world style. The fruit in this wine is ripe and sweet, but it doesn't take over or define the wine. The bulk of the Marsanne for this wine is grown in the Ibarra-Young vineyard, which Lindquist has farmed organically since 1999. Marsanne fruit is also purchased from several sources, also organically farmed, including Demetria and Purisima Mountain. Qupé grows Roussanne in their portion of the Bien Nacido vineyard, but the Roussanne for this wine is purchased from Stolpman. Changes are coming, as one source lost their 2008 crop to frost, another decided to keep their fruit, and Qupé has new vines in Edna Valley. But Bob Lindquist says that the style of the Marsanne will stay the same going forward. The grapes are whole-cluster pressed, the juice is fermented in neutral barrels and goes through complete malolactic fermentation. It is bottled after between 5 or 6 months in barrel. 1533 cases were made in 2007, as well as 200 cases of half-bottles. Lindquist says that although the 2007 is delicious young (and it is), it will age very well. He has been drinking his 1994 lately, and loving it with maturity - "it gets honied and nutty." It's still not in my plans to buy a load of California wine right now, but I do plan on buying more of this wine. In fact, one bottle will go into my daughter's birth-year case. 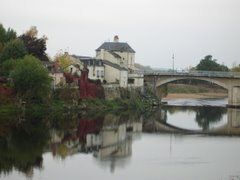 It is delicious wine that does well with food - we enjoyed ours with roast Blackfish with capers and tarragon. I wonder, for what is a big step up in price, are the other Qupé whites equally compelling? Maybe I'll find them in local stores next time I visit my in-laws in San Diego, as I haven't seen them here in New York. So recently I'm at a Wine & Spirits blind tasting called "2007 in Germany," and the strangest thing happens. About halfway through the tasting, when we hit the Mosel, I come to a wine that really reeks of hard boiled eggs. There is one more wine in the flight, and I smell that one too, and it also reeks of sulfur. I look around the table to see whether or not anyone else seems to have noticed, and I see at least two confused faces. So I ask the critic, "Is something wrong with number 21? And maybe with number 22 also?" And I have that smug feeling like I am so good that I'm going to speak up in front of everyone, that's how sure I am. But I was, in fact, wrong - there was nothing at all flawed about the wine, even though it reeked. The critic and the tasting director exchanged a quiet word or two, and then the critic said "Do you know about the sulfur smell with Mosel, slate, and native yeasts?" None of us knew, and be honest, did you know about this? Apparently, wines from the Mosel, when they come from vines on slate soils, and when they are fermented with native yeasts, give off a distinct sulfur stench in their youth. But they develop quite well, the critic assured us. We were encouraged to ignore the smell and taste the wines. I honestly had a hard time doing that. How can you taste a wine when your nasal passages are filled with sulfur stench? I held my breath and took a sip, and the wine was...excellent. Beautiful clear fruit, elegant, poised, great structure, just a delicious wine. But what about that smell? "It goes away in time,' I was told again. So let me make sure that I understand this: Riesling from the Mosel, IF it is grown on slate, and IF if is fermented with only its own yeasts, stinks of sulfur in youth, and THEN becomes beautiful? Apparently, the answer is yes. This doesn't happen anywhere else? Or on limestone soils? Or with wines grown on slate but fermented using industrial yeasts? Does it depend on the character of the vintage? No, no, definitely not, and no. What is the science behind this? And why would they allow this to happen in the Mosel, in this money-rules day and age? Aren't they afraid that consumers will be turned off to their wines, given that they smell like a chicken coop, and that they will lose business? I tasted many Mosel wines at this tasting, some of which had no sulfur smell at all. But I also tasted eight Mosel Rieslings that reeked of sulfur, and each one was somehow more delicious and compelling than the last. And all of those eight were made by JJ Prüm, the venerable old grandmaster of the region. Eight truly rotten and stinky wines, all of them delicious, and all of them apparently destined for greatness. And to think, had I purchased and opened a bottle of 2007 JJ Prüm Riesling Mosel Kabinett Wehlener Sonnenuhr, I would have returned it to my retailer, finding it flawed. I wonder how many people do that. If you can figure out this whole wine thing, then more power to you. Last week I had the opportunity to drink some pretty fancy wine. BrooklynLady and I had some out of town (out of country, actually) friends over for dinner and we opened a few nice bottles. And my pal Bruce had a bunch of people over for dinner and selected Burgundy as his wine theme, and he was quite generous with the bottles he opened. I don't often drink wine of this caliber and I think it can be tricky to evaluate. High expectations can color things. If I'm tasting blind, I can give you my thoughts and there's nothing tricky because I have no idea whether or not I'm supposed to like the wine. But if I open a bottle of 1978 Domaine Dujac Clos de la Roche with you over dinner, evaluating the wine would be tricky. I hardly ever drink wine of that caliber and I would so very much want to like it. And yet I would have such high expectations, the wine might have to be perfect in order to live up to them. This is purely hypothetical by the way, because I possess no such bottle of '78 Dujac. But you get my point. Since I am only an occasional drinker of fancy wine, I think it's easiest to evaluate by simply classifying it as an overachiever or an underachiever, or as a wine that performs exactly as it should. The simplicity of this helps me avoid some of the over-thinking and the hype. Here are the fancy bottles I'm talking about from this week, and by fancy I don't necessarily mean expensive, by the way. For me, fancy wine can also be a bottle by an iconic producer whose wines I simply do not often have the opportunity to drink. 1999 Domaine Leroy Meursault - Tough to get a handle on, but with time to re-taste and to think about the wine, it kind of blew me away. It's still a baby with a somewhat disjointed feel, and with almost too-intense acidity. But the fruit is so absolutely crystalline and pure, and the sense of mineral soil is so complete. The wine simply has incredible presence. This is Leroy and it's supposed to be among the very best wines of Burgundy. Is there a finer drinking villages Meursault right now? I don't know. But this one is fantastic, and it will get better. Would I feel the same way If I tasted it blind? I don't know. Not everyone at Bruce's house liked it. In fact, I liked it more than everyone else. I'd take a half case for the cellar and re-visit in 5 years. Provided that I find a thousand dollars on the street, that is. 1997 Champagne Salon Brut Blanc de Blancs - I drank this at the recent Wilson Daniels tasting. Before I drank it I asked my friend Tista who directs the estate's exports if it is surprising that Salon would make a 1997. "Not at all," he said. "Many top producers in the Côtes des Blancs made vintage wine in 1997." Shows you what I know. Anyway, this is supposed to be great wine - it is Salon. And it really was great - just amazing, with astounding complexity, layers of mineral and fruit, and a truly regal and graceful presence. I'm not sure what could happen to Blanc de Blancs so that it would be better than this. Tista poured me first the wine from the bottom of a bottle that had been open for a few hours, and then sent me off to sit with a glass from a fresh bottle. That was a good morning. 1981 López de Heredia Rioja Gran Reserva Viña Tondonia - this noble white wine was served blind, as I served all of the wines blind for our out-of-town friends. I was the only one who knew what it was. This was incredibly fresh, utterly defying its 28 years of age. There was a complex interplay of fruit and secondary flavors, a slightly saline and nutty note, and a persistent finish that seemed to offer a replay of each sip in its entirety. Great wine, and it's wine that is supposed to be great. Worth every penny. 2002 Domaine Leflaive Puligny-Montrachet 1er Cru Clavoillon - Bruce opened this wine alongside the Leroy, and it was more open and ready to drink. It was clean cut and lovely with ripe fruit and bracing acidity, and a strong mineral sense. It is an elegant wine with delicious fruit and bitter herb flavors, and a stony finish that really persists. Which is exactly what I would expect from such an exalted producer. NV Jose Dhondt Brut Blanc de Blancs - Served blind at our dinner. Tista actually nailed it as being from Oger, which is a little scary. Chalk infused citrus fruit with a lovely sheer texture, great acidity too. Delicious wine, exactly as it should be. 1998 Chateau Simone Palette Blanc - Served blind at our dinner. From the iconic producer in Provence, this wine is a blend of about 47 different grapes. Okay, five grapes, maybe. Not a terribly expensive wine (although Simone has recently gone up in price), but not an easy find either. This was described by one guest as "a good wine, but not a great Simone," and that makes sense to me. I've only had one other Simone Blanc, and I was much more excited that time. This one was so fresh and youthful that it didn't really offer the nuance and complexity that one might want from a 10 year old white wine. It was perfectly good, but not exceptional, and it's supposed to be exceptional. 2002 Nicolas Potel Vosne-Romanée 1er Cru Les Suchots - Let me tell you firstly that everyone else at Bruce's house really liked this wine. And it was, in fact, delicious wine - the nose was quite shy, but the fruit was ripe and dark with lovely floral notes and there was good acidity and balance. What's not to like? Nothing - I liked it too. But to me it is an underachiever in the sense that it just wasn't very complex, and there was little about it that spoke of Vosne-Romanée. That doesn't make it bad wine - as I said, a crowd of people really liked it. But when I spend that kind of dough on a bottle of red Burgundy I'm looking for more of a terroir stamp. I know, I'm a wine curmudgeon. NV Champagne Lallement Cuvée Réserve Brut Grand Cru - Served blind at our dinner. Perhaps the top producer in Verzenay, Lallement makes tiny quantities of superb wine, based mostly on Pinot Noir. Cuvée Réserve is made from the estate's older vines, 80% Pinot Noir and the rest Chardonnay, and is a blend of at least two vintages. Which vintages in this case I cannot tell you, as there is no indication on the bottle (honestly - I am SO DONE with producers that will not provide me with proper information on the bottle). I've had great bottles of this wine, and poor bottles, and this was a poor bottle. As Peter Liem, Champagne guru succinctly put it when it was unveiled, "this bottle did not show well at all." Equipo Navazos La Bota de Manzanilla #8, and La Bota de Amontillado #9, Eric Solomon Selections / Polaner Imports. #8 is no longer available and I don't know the price, #9 retails for about $65. That's right - two wines for this week, both incredibly special, and both incredibly rare. They both came to me courtesy of Peter Liem, who recently brought them to dinner at my place. He also brought a trove of olive oil, but that's another story. There were 7 people at this dinner and a whole load of wine and so about a third of each bottles of Sherry remained at the end of the night, allowing me to taste them over the course of the next several days. Excitement! In a way, it doesn't feel right for me to be drinking these wines. It's like beginning to learn about Burgundy by drinking a few bottles of DRC and old Leflaive. La Bota wines are among the finest Sherries in the world, but I simply haven't had enough Sherry to understand why these wines are better than other Sherries. But in the same way that DRC is magnificent, these Sherries are magnificent to drink, even without a load of Sherry experience, and I'll do my best to describe them. What differentiates these wines from other sherries, even from sherries that are produced out of the same soleras, is that they usually select a smaller range of barrels from the solera, looking for wines that have a strong personality and distinct character, and then bottle these unfiltered, which is very rare. The vast majority of sherry undergoes a heavy filtration that dampens much of its flavor and aroma, and it can be downright startling to compare an unfiltered version of a similar wine. The Manzanilla #8 was bottled in October of 2007, so it has a small bit of bottle age. Common wisdom is that Fino and Manzanilla Sherries do not benefit from bottle age, and I certainly cannot confirm or refute this, but I can tell you this: the wine changed each day after it was opened, achieving the greatest complexity three days after the dinner. I would gladly have continued the experiment, but alas, no more wine. La Bota de Manzanilla #8 is pungent on the nose with brisk salt air and a rich nuttiness, all framed by a subtle character that I just don't know how to describe, other than to say that it smells like a beautiful old wine cellar. Yeasty energy, wood, moldy air, full of promise. In the mouth this wine does such an interesting thing - brisk saline and nutty flavors linger on the tongue and roof of the mouth, while a creamy floral briny fragrance immediately pushes through the nostrils and down the throat. Then there is a wave of acidity in the mouth, and although this wine is bone dry, there is something vaguely sweet about the scent it leaves in the mouth. By the third day open the wine took on a brown butter type of character on the nose, and was somehow even fuller on the palate. This wine is a sensory explosion, really a stirring experience, and I would take great care not to drink it while experimenting with LSD or any other hallucinogen, no matter now mild - the combo could really screw with your circuitry. Amontillado is what Manzanilla becomes with more fortification (this wine is 20% alcohol, the Manzanilla is 15%), with further oxidation, and with age. I find La Bota de Almontillado #9 to be a far more aggressive and burly wine compared to the Manzanilla. The nose retains some of the brisk Manzailla character, but is definitely more creamy with an older, more oxidized nose of orange peel, roast chestnuts, and freshly chopped wood. It is darker and richer in the mouth than even the nose would suggest, coating the mouth with a toasty, almost earthy sense. The finish is incredibly pungent and it is essentially impossible to taste anything else after drinking this wine. My only quibble is that I am a bit distracted by the alcohol, which is not gawky at all, but I do notice it. And I don't on the Manzanilla. I think that I simply prefer the Fino and Manzanilla style over the Amontillado style right now. Many thanks again to you Peter, for your generous gifts, and for sparking my interest in Sherry. One of the confusing and intriguing things about Jura wines is the distinction between technique and terroir. By technique I mean sous-voile, or under-the-veil wine making, a style in which wine is intentionally oxidized. The barrels are not entirely filled to begin with, and then are not topped up as the wine evaporates and seeps into the wood. A beneficial layer of yeast (the veil) is encouraged, somewhat akin to the flor in Sherry. In the hands of a good producer, sous-voile wines are completely delicious. I wonder, though, whether they are more an expression of technique or of terroir. Not that it matters in order to appreciate the wines - they taste and feel good, and they makes great company for fresh seafood, cheeses, and other foods. But I am curious, especially because most producers make only tiny quantities of sous-voile wines, the bulk of their production is "regular" non-oxidized wine. And the good producers are quite interested in and adept at making wines that showcase terroir over grape character. I recently went to Vins du Jura, a tasting featuring 20 producers from the Jura region of France. It was a great opportunity to taste a lot of Jura wine and to think about and compare terroir and technique. This tasting was mostly about helping producers connect with potential importers, it was not a survey of one importer's or distributor's portfolio. Well known (if there really are any well known Jura producers in the US) producers like Houillon, Puffeney, and Montbourgeau already have rather illustrious representation, and were not present at this tasting. Yet Tissot was there, as were a few others that are already imported, so I don't really know how this was organized. No matter...Prices were not given, so I cannot discuss the wines that interested me in terms of value. I can, however, discuss them in terms of interest, and there were some great wines. My favorite sous-voile wines of the tasting, in no particular order, were the 2005 Domaine Andre and Mirielle Tissot Arbois Savagnin, 2005 Domaine Labet Savagnin Vin de Voile from Côtes du Jura, and the 2004 Domaine de la Pinte Arbois Savagnin. Pinte's 2002 Vin Jaune was also promising, but the enamel-stripping acidity and tightly wound youth of the wine made it hard to evaluate for a Vin Jaune neophyte like myself. These are all wonderful wines that I would eagerly purchase, especially if they are priced in the $20-30 range. And they are quite different from one another. Tissot's wine is ultra clean and light, and redolent of nuts and salt. Labet's is also very clean and bright with nuts and salt, but with greater richness and depth, or so I thought. My notes say "mahogany depth," whatever that means. And Pinte's Savagnin is salty and nutty and exceptionally pure, with curry spice notes, feeling quite lean on the nose, but full and rich in the mouth. Are these differences about technique in the barrel room? About work in the vineyards? About soil and place? I will continue to enjoy these wines and other like them whether or not I learn the answer to those questions, but don't you want to know? I want to know. One day I will have the good fortune to drink a group of sous-voile wines with someone who can lead me through and describe them in terms of technique and terroir. Tasting through the lineup of wines by Domaine Labet in Côtes du Jura was a great lesson in Jura terroir. Julien Labet explained that the Jura is incredibly diverse in terms of soils, because the formation of the Jura Mountains moved (and are still moving) layers of ground in random ways. Chardonnay in his hands is really just a vehicle for expressing soil. His 2007 Fleur de Chardonnay comes from 45 year old vines on chalky, rocky soil. It is fermented using indigenous yeasts and aged for almost 18 months in barrel. The wine is intensely mineral and a bit smokey, with what could plausibly be described as a total absence of fruit. But the wine has a broad mouth feel and is delicious. 2006 Chardonnay Les Varrons is also from chalky ground but the layer of topsoil is very thick, and the wine is round and intense with summer fruits and nuts, much less mineral than the Fleur de Chardonnay. 2006 Chardonnay La Reine is from deep red clay soils and is the most citric of the lineup, with clean grapefruit flavors. 2006 Chardonnay La Beaumette has a fruit profile that is similar to Les Varrons, but the wine is much racier and leaner - and I didn't note the soil type, I'm sorry to say. La Beaumette was perhaps my favorite of the bunch, although they were all delicious and interesting wines. If they are in the $20-30 range, I will most certainly be a good customer, potential importers. Honestly, potential importers, you're crazy if you don't bring in this guy's wines. I sense more Jura wine in my (immediate) future. Cherry blossoms in peak bloom. The petals are already falling rapidly from this weekend's wind and rain. My 2 year old buried her face in these. There are white ones too. It's not all cherries. There are Grape Hyacinth. 2007 Domaine Bernard Baudry Chinon Cuvée Domaine, $18, Louis/Dressner Selections. 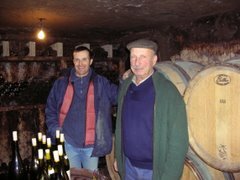 I have no scientific evidence to back this up, but I'm going to go ahead and say it anyway: Bernard Baudry and his son Matthieu are making the best wines in Chinon. All of Baudry's wines are delicious and offer great value, but I have a soft spot for Cuvée Domaine, probably because the 2003 was the first Baudry wine that I ever drank. Cuvée Domaine is a blend of grapes from gravel and clay soils, the ratio is about 70-30 in most years. The vines are at least 30 years old and are right near the family's house in Cravant Les Coteaux. I love Cuvée Domaine in general because although it is most definitely a serious wine that benefits from short to mid term aging, it drinks beautifully when young. To me it represents what every entry-level Chinon should aspire to - perfectly ripe fruit, very mineral, and great acidity for balance - this is a truly food friendly wine. The 2006 was remarkable in that the grapes for Les Grézeaux, one of Baudry's higher level wines, went into Cuvée Domaine. In that year the wine was deeper and more structured than usual, and although delicious, seemed to need overnight air before showing its best, or perhaps a bit of time in the cellar. 2007 is the current vintage and it was not an easy year - lots of rain and associated rot meant low yields. But from what I've tasted, the wines are stunning, right up my alley. They are graceful and pure with fantastic transparency, vibrant and energetic. The 2007 Cuvée Domaine is just a wonderful wine. There are clean and pure red fruits on the nose, but they serve as a vehicle for classic Chinon graphite and earthy aromas, and there is even a touch of chili pepper. The palate is fresh and juicy with very strong acidity and it confidently contrasts delicacy of fruit and earth with extraction and intensity. It leaves a pungent earthy perfume in the mouth after swallowing. It is utterly delicious to drink right now, but I imagine that it will only improve over the next 3-5 years. And it costs all of $18. This is a wine that is well worth having shipped to you if you can't find it in your area - it really is that good, and the price is right. And Joe Dressner didn't pay me to say that.